Megan Fabbri is creating ART! I am a graduate of the School of Visual Arts' BFA 2017 Cartooning program! My skills range between the following- illustration, writing, HTML coding & CSS, comics production, drafting, layouts, storyboarding, character design, background design, sewing, costume design, and utilization of a plethora of tools! Right now, my focus artwork pertaining to mental health, a subject that is very personal for me and many others. My intention is to create content that diminishes the stigma surrounding mental health and forms of treatment. At the moment, I'm building on my #Purrozac design, which some of you may already be familiar with already! 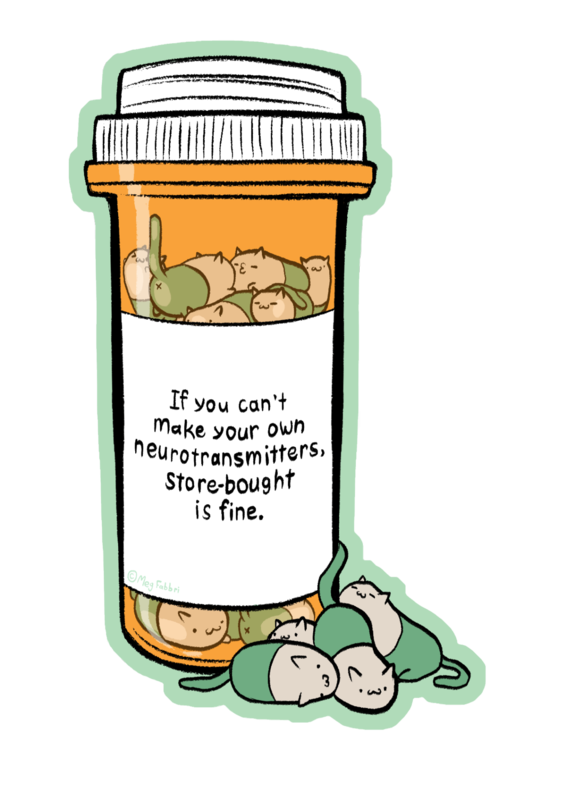 Currently on the table is an enamel pin, plush toys, resin figurines, and additional works of cute pill friends. As I am producing these things, however, it would be a huge help to have some financial support. If you can throw a little my way, you'll have access to sneak previews of prototypes and finished products before the rest of the world! You could even have priority access to pre-orders & limited runs of items! I'm also producing a webcomic entirely by myself with it's own patreon separate from this. Check it out on www.TheFoxsGarden.com & find the patreon link there. This will help with my utilities bill & food!